FSX – Welcome to the Heart of Idaho. The simulation consists of 19 airports in Central Idaho. Twelve existing strips have had improvements consisting of strip surface improvements to allow all-season activity, and some eye candy. Seven new facilities have been added to the area. Two have float plane runways. FSX – Eugene Oregon’s Mahlon Sweet Field KEUG. KEUG has been updated for FSX. The new runway [16L-34R] is active. Taxiways now conform to the current FAA Airport Diagram (copy included). All of the structures are new. FSX – Las Vegas McCarran Airport. Welcome to Las Vegas! McCarran airport has been updated for FSX. All Terminals are depicted, as are the west ramp structures and the new cargo facility. All of the structures are new. Taxiways now conform to the current FAA Airport Diagram (copy included). FSX – Spokane International Airport. The Spokane International has been updated for FSX. All of the structures are new. Taxiways now conform to the current FAA Airport Diagram (copy included). Runway 03/21 has been extended to its current length [11002 ft]. Gates are assigned based on current airport information. FSX – Reno Tahoe International Airport. 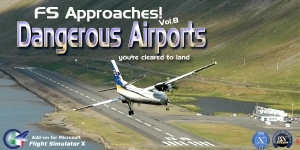 The Reno airport has been updated for FSX. All of the structures are new. Taxiways now conform to the current FAA Airport Diagram (copy included). Thanks to Jim Dhaenens for the asr9 radars! You will see airport vehicles all over the airport, using the vehicle paths correctly.